EZ-Gro Chitosan is a plant growth enhancer that is also used to boost the defensive ability of plants in fighting fungal infections. Its active ingredient, chitosan, is a natural compound found in the shells of crustaceans and other shellfish. Chitosan enhances the ability of plants to survive in times of heat or cold stress and drought. It can give plants the ability to grow with less water and can accelerate growth and germination, and improve the quality of flowers and fruit. Apply EZ-Gro Chitosan to your crops to protect against fungal infections, heat and cold stress, drought and improve overall quality. 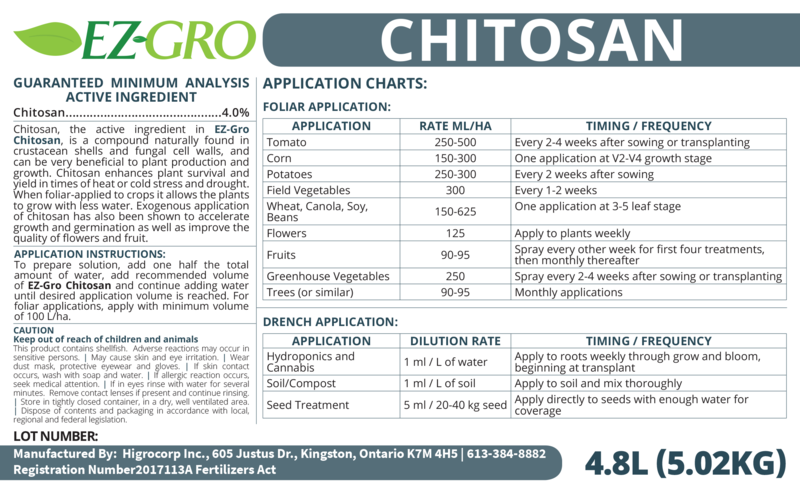 • Chitosan has been proven to accelerate growth and germination as well as improve the quality of flowers and fruit. It increases the number of useful soil microorganisms and decreases harmful ones. • Chitosan is a sugar polymer derivative of chitin that functions as a growth enhancer and antitranspirent (it allows the plants to grow with less water). • Chitin resembles cellulose in both structure and function, and is used as a structural polymer in crustacean shells, insect exoskeletons, and fungal cell walls.